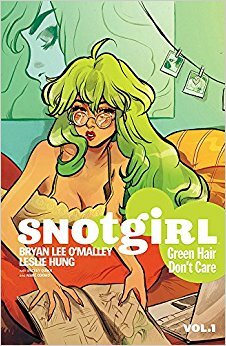 Snotgirl is a successful fashion blogger with a much more glamorous online life than real life, and with boyfriend problems to boot. Written by Bryan Lee O'Malley, I was immediately uncomfortable with the premise and the fact that a male was telling the story. A shallow fashion blogger? Is that a stereotype? Does it demean "female" interests? And the boyfriend issues? This certainly wouldn't past the Bechdel test. But just as O'Malley might be question for his ability to fairly tell this story, perhaps I might be questioned for my ability to discern if this is offensive or fair to women. So, I went looking for critiques by females to see what they thought. If this discussion by the crew at Women Write About Comics is any indication (and I realize that they don't necessarily speak on behalf of all women), it didn't seem to be a major concern, at least not in the first issue. It was enough, at least, for me to put my concerns on the back burner and focus on other aspects of the story and art. As you may have gathered from the title, this is a very quirky book. The humour (yes, sometimes of the gross-out variety) helps round off the edges of some very compelling characters, none more compelling that Snotgirl herself. Perhaps it's a by-product of the very current, very deftly handled theme (i.e., our online personas versus our our "real life" personas), but Lottie Person, a.k.a. Snotgirl, is a flawed mess. I didn't, however, dislike her because of it. Sometimes I pitied her, and sometimes I definitely disliked her choices, but I liked her more in the end because she felt authentic. None of us are perfect, especially to the level that social media demands. In the end, I quite enjoyed the book. It was super entertaining (it was different, it was funny, it even had a mystery that has hooked me enough to read the second volume) and had some real intelligent food for thought buried just below the surface.